Last night my wife and I went to the theater to see "True West", which is Sam Shepard's tale of two brothers. 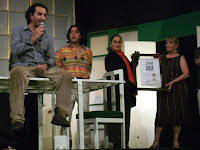 It is a very interesting play, and the Mexican adaptation is excellent. Before going to the theater, we decided to stop by a Starbucks. It was a very slow Sunday, but we really enjoyed the play.